CLICK HERE TO BOOK LASER TAG! 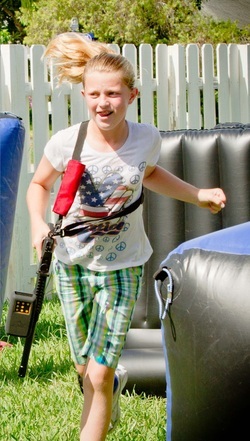 Laser Tag of Miami is South Florida’s premiere mobile laser tag provider. Dedicated to providing a unique and memorable service, you can expect an effortless and wonderful time for everyone! Our staff will handle everything and there is no effort required on the hosts part. Our laser tag system is the most advanced in the industry, and with it we serve the greater South Florida area. If you are looking for a hassle free, yet engaging and exciting way to entertain guests at your upcoming event, Laser Tag of Miami is the right business to call! Our system is unique in all of South Florida for both its flexibility and cutting edge technology. Our powerful software can both allow for custom games to be created at the event quickly and provide detailed and accurate scoring. The phasers themselves also allow for the greatest in-game feedback possible, with the on-phaser screen letting you know exactly how well you are doing and what exactly is happening during game play (details here). Our potent combination of technology and service ensures that guests will have the ultimate laser tag experience at their event. We are a Miami-Dade and Broward County Parks approved vendor!